Being bookish, I only ever played scrabble…le sigh. Loved this post – gave me mega flashbacks. Now I did play Game of Life – my friends and I seemed to like collecting kids so would often buy a second car to fit them all in (how naive is that – now I’d like the number of kids I have to be able to fit in the one same car with me ;o)). Lots of fun memories associated with these games. My children still love them. We do game night often. I am with you. Leave the classics alone. We played them just as they were for a lifetime. They do not need “improvement”. Found you on the A to Z! 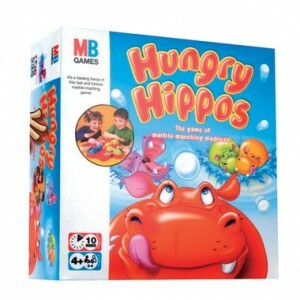 You had me cracking up at the Hungry Hungry Hippos. My cousins had it, too. As a parent, I can see why my mom would not buy me that toy. Let’s see: roll these marbles all over the place, hit this lever as hard as you can, and try to do it all louder than the person next to you? Yeah. My cousins were *lucky* to have such nice parents! Thanks for a great walk down memory lane! Keep up the great work!